In ZENworks Control Center, click Full Disk Encryption, then click Pre-Boot Authentication Override. In the Request ID fields, specify the request ID sequence supplied to you by the user. 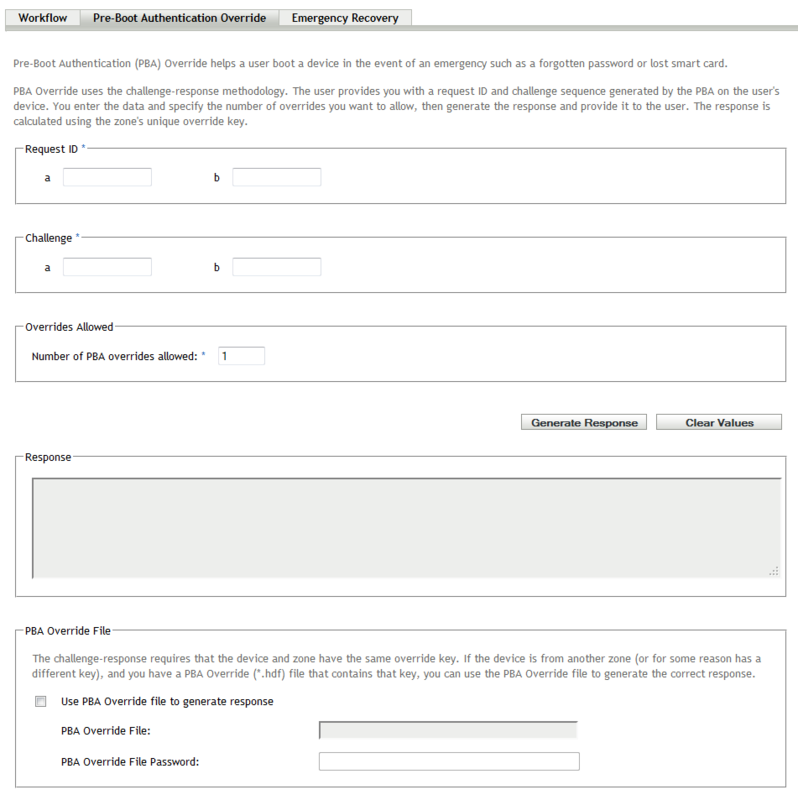 The request ID sequence must be identical to the sequence presented to the user on his or her device. Your Request ID field A corresponds directly to the user’s Request ID field A and your Request ID field B corresponds to the user’s Request ID field B. Incorrect characters or order cause a sequence mismatch, resulting in an error when generating the response sequence. In the Challenge fields, specify the challenge sequence supplied to you by the user. As with the request ID sequence, the challenge sequence you enter must exactly match (characters and order) the user’s challenge sequence. In the Overrides Allowed field, specify the number of times you want to allow the user to boot the device without providing PBA authentication. Supply the response sequence to the user. As with the request ID and challenge sequences you entered earlier, the user must enter the response sequence to exactly match (characters and order) the generated response sequence.